Over 2500 delegates from almost 80 countries participated in an international scientific congress entitled Climate Change: Global Risks, Challenges and Decisions last month in Denmark. The goal of the three-day congress was to examine the scientific knowledge that has emerged in the two years since the Intergovernmental Panel on Climate Change (IPCC) released its fourth assessment report in 2007. The gathering also explored the synthesis of science, technology and policy advances required in order to ensure global sustainability. In addition, during Session 43, the idea emerged that collaboration between scientific and traditional knowledge, which at first seem to represent disparate views, could play an important role in achieving this. The findings of the congress will be handed over to policymakers in June in the run-up to the 15th United Nations Climate Change Conference (COP15) in December. An extension and elaboration of the synthesis report will follow in book form next year. Many important messages emerged from the gathering. Overall, the discussions signaled that the international community’s inaction on climate policies is no longer acceptable. Policies and adaptation technologies that take into account new scientific knowledge were presented and discussed. They included results of new sea level rise simulations that showed an increase from projections contained in the IPCC fourth assessment report. At the closing session on the final day, talk focused on the sufficiency of a 50% reduction by 2050 of global greenhouse gas emissions from 1990 levels, which is currently being considered as a long-term reduction target. 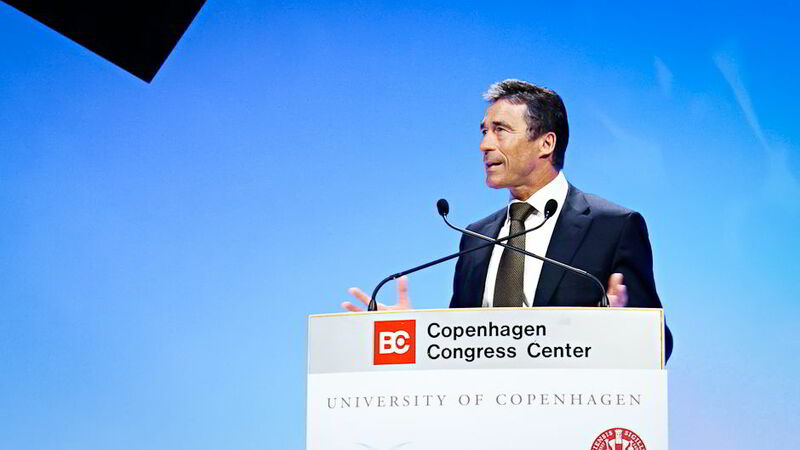 Danish Prime Minister Anders Fogh Rasmussen, who will likely host COP15, asked scientists whether this target is scientifically adequate. In fact, he demanded a concrete “yes or no” answer as to whether these targets, derived from scientific research, could become the basis for policy decision-making. Since the IPCC’s fourth assessment report was published, the view that human activities are the major cause of climate change has become mainstream. The consensus view at the congress was that the international community needs to take urgent action. However, scientists, wanting to provide only objective evidence, tend to present results that reflect uncertainty and have room for risks. But such scientific predictions, participants argued, make drafting policy difficult. The discussions at the final session highlighted the different stances of policymakers and scientists and showed the need for scientific experts to provide information that can be translated into workable policies so that the international community may take action. Discussions on global sustainability are urgent, and so scientists are required to offer answers that are more concrete. The theme of Session 43 was “Integrating Climate Change into Global Sustainability”. Among the people who delivered presentations on this topic were University of Tokyo President Hiroshi Komiyama; Abdul Hamid Zakri, former director of the Institute of Advanced Studies at the United Nations University; and Carl Folke, Science Director of the Stockholm Resilience Centre. Reports by these three people became key to the session and were central in discussions on possible policies and technologies. Professor Komiyama stressed the necessity of “structuring” scientific knowledge and “structuring activities” based upon it. Professor Zakri pointed out how the Millennium Ecosystem Assessment could contribute to decision-making when drafting policies dealing with global warming. Similarly, Professor Carl Folke made a presentation on the adaptation of socio-ecological resilience to the issue of global sustainability and the possibility of policy intervention. During the session, various methodologies related to these topics were presented. They included the adaptation of ontology concepts for simulation analysis and structuring methods, and field studies. In addition to scientists, several representatives of indigenous peoples also attended the session, providing very interesting reports and participating in the ensuing discussions. These participants asserted that achievement of global sustainability depends not just on data from science and academia, but also on traditional knowledge that exists outside of these systems. The indigenous participants questioned the validity of the figures that represented the reduction in forest areas. This question was similar in spirit to the one raised by Prime Minister Rasmussen when he asked for a clear “yes or no” answer. Results from simulation models always contain some uncertainty. In other words, scientists are only able to offer objective evidence that is perhaps simply “a safe answer”. They can accurately point out a trend but with some uncertainties. Having said this, scientific knowledge is undoubtedly useful for indigenous people, even with some uncertainty. At the same time, scientists may be able to reduce uncertainty and risks by obtaining wisdom only found in traditional knowledge. This means that, if collaboration between indigenous people with traditional knowledge and scientists takes place in global sustainability discussions and is included in the process of “structuring of knowledge” and “structuring of action,” we may be able to come up with a more workable and effective international strategy for global sustainability. The indigenous point of view was certainly a big contribution to the debate over global sustainability in Session 43 of this very important congress. Scientific Fact: No Time for Fence-Sitting by Kazuhiko Takeuchi is licensed under a Creative Commons Attribution-NonCommercial-ShareAlike 3.0 Unported License. Based on a work at http://ourworld.unu.edu/en/scientific-fact-no-time-for-fence-sitting/.